Republican Presidential Candidate John Kasich fielded questions from about 200 people during a town hall event at Brilex Industries in Youngstown Monday. Jim Tressel, president of Youngstown State University, introduced the governor and U.S. Sen. Rob Portman who also appeared in support of Kasich. Kasich said he’s working together with Tressel to make sure YSU becomes one of the great universities in America and praised Tressel’s tenure as president. He also singled out Tom Humphries, president and CEO of the Youngstown Warren Regional Chamber, for his involvement in the controversial effort to reform Youngstown City Schools. Tressel said he wanted to support Kasich when he heard the governor was coming to the Mahoning Valley. 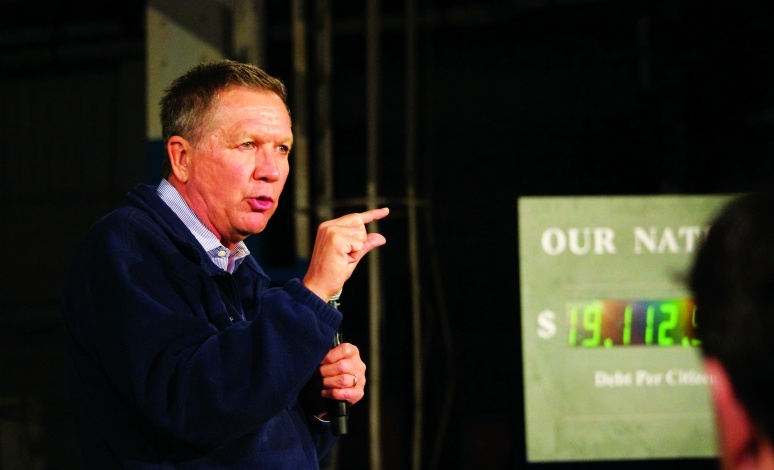 He complimented Kasich’s experience and a generosity that extends even to neglected populations like addicts. “I’ve gotten to know him over the years and found him to be deeply carrying about everyone,” Tressel said. He also said he approved of his demeanor in what has been a contentious Republican primary. “The way he’s approached a very rough and tumble couple months, he’s presented the state of Ohio in a good light,” Tressel said. The governor talked about the need to reduce the deficit and limit regulations on small businesses to create economic growth. He also told supporters about his role in balancing the budget during his time in congress. He claimed the same formula resulted in job growth in Ohio during his time as governor. He said moving from an $8 billion deficit to a $2 billion surplus has allowed the state to help people who have been hurt including the mentally ill, the drug-addicted, the working poor, the developmentally disabled and minorities. He claimed leadership kept Cleveland calm in the wake of difficult court decisions as opposed to the violence that has broke out elsewhere in the country. He said they have reduced recidivism by treating drug addicts in prison and have worked hard to get developmentally disabled residents involved in the community. 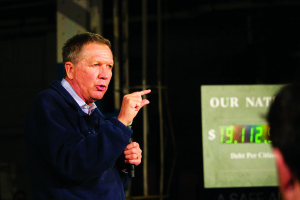 Kasich received questions about education and healthcare policy as well as climate change. To close the town hall, a woman tearfully asked the governor why he closed the Youngstown Developmental Center. Kasich said they decided it was best to allow people with developmental disabilities to live in group homes. YSU student Kelly Motika attended the rally and was able to sit in the front row.